Half human half faerie Sadie is part of a resistance to stop humans from operating on newborn fae, removing their ability to Dream. It’s only through dreaming that new dragons can be born from faerie trees although, amusingly, it is dragon blood, injected into the skull of a newborn, that takes away this ability. Sadie managed to avoid ‘slicing’ as an infant, and she and her dragon play a significant role in the resistance until new Controller, Evelyn, takes control of the faerie forced labor camp and challenges everything Sadie believes about humans, and love. Enbies, dragons, magic, and lesbians? Yes, please! 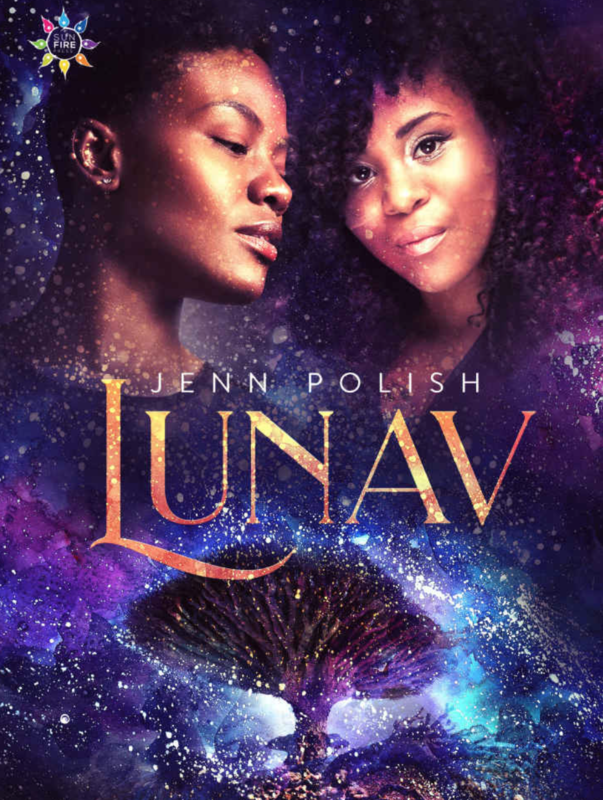 The (gorgeous) cover of LUNAV is another easy selling point, although between the fireflies, soothing colors, and back blurb, the book sells itself as more sword and sorcery fantasy (or even romance fantasy) than dark fantasy. And the book is dark. Not gory or gritty, but definitely dark. The first half of the book is dedicated to bringing the reader into the world and the atrocities taking place against the fae. Talking about downed trees as ‘bodies,’ loggers as butchers or murderers, and the general tension revolving around every slicing of a newborn makes for a very engrossing world, and keeps tension high. There was a slightly steep learning curve in the first chapter with the new words (a glossary is provided in the back of the book, which of course I forgot to look for until the last chapter), but after I got the hang of the dictionary I was solidly hooked. There was some redundancy early on, but it didn’t detract too much from the narrative. We’re not presented with a solid through line at the start of the book, but the strength of the world and the tension in the resistance brings the reader well into the middle of the book before you realize you’re not quite sure where the book is going (but I was pleased enough to be along for the ride). Luckily the romance line picks up about three quarters of the way through and from then on, the book moves with more purpose. Generally, the plot revolves around the human reaction to a ‘plague,’ which wiped out a significant portion of the population. To prevent against further outbreaks, the king has mandated the end of Dreaming (which he believes is related to the plague). Of course, killing dreaming in humans is one thing, but in faeries, means no more dragons, and a lack of general empathy all around. Several resistance missions during the book are well done and move the plot forward in increments, although an overarching goal is lacking. Sadie is a very sympathetic narrator, and it was easy to slip into her POV. She will resonate with anyone caught between two worlds, and not able to belong to either. The secondary characters, especially Sadie’s mothers and brother, are rounded out and endearing. The love interest, Evelyn, was fairly flat at the start but once the romance line really got going, she became my favorite character. Interestingly, I think this book could have benefited from being in third instead of first, and having two POVs (Sadie AND Evelyn), since Evelyn’s POV (which we get through a Dream from a faerie) is compelling and deliciously complex. I’m guessing this is a first in a series, so it will be interesting to see if perhaps we get a POV switch in the next book. I’d love to follow Evelyn on her adventures as she returns to the king. So much in-world queer! While the main romance line is lesbian, Sadie’s mothers are also in a f/f relationship. There is tons of nonbinary rep, from an acknowledged third gender, to no gender being assumed of children until they grow enough to make their own decisions. An interesting set of neopronouns was used in the book: que, which I was unfamiliar with but quickly loved. Generally, this book could best be described as heavily atmospheric–something you read for that sense of place, to be immersed in a world you love. It had a lot of parallels to THE GOLDEN COMPASS in terms of darkness, but wraps you into the world much like SUNSHINE. You can buy LUNAV in paperback here and ebook here.